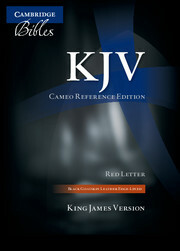 The Cameo Bible is one of the classic Cambridge editions of the King James Bible, dating from the 1920s. The Bible text was set in an attractive historic typeface, Petit Medieval Clarendon, and is printed large enough to be clear and easy to read while small enough to result in a compact Bible. 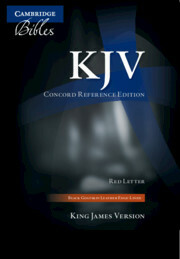 The Bible has pronunciation marks for difficult words and phrases, full cross-references, a concordance and maps. Unavailable for a while, the Cameo Reference Edition was recently re-issued in response to continued consumer interest, in a new range of binding styles. The Bible comes with a concordance and 15 color maps. The text has pronunciation marks for names and the words of Christ on earth are printed in red. 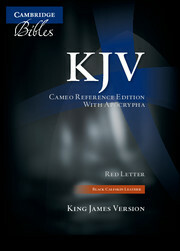 This edition includes the Apocrypha. It is one of the very few current editions of the King James Version so to do. It is printed on India paper art-gilt edges and is bound in black calfskin leather. Great quality. Flexible and resistant (i.e. resilient). Beautiful and elegant design. Comfortable, very portable and easy to read. One of the few issues including Apocrypha. And, it's also the very faithful Cambridge Edition of the Authorised Version. Such features make this product a unique and valuable Bible. Compare the structure of the text of this edition in order to the firsts Authorised Versions: Very respectful in that sense (The firsts pages, the Epistle Dedicatory and The Names and Order of all the Books...: 1. the Old Testament / 2. the Apocrypha / 3. the New Testament). I appreciate that very much. In my opinion, this is a very real and genuine edition of the Authorised Version Bible. My rate of this item: Five stars. I like the book but would like to look in the book.